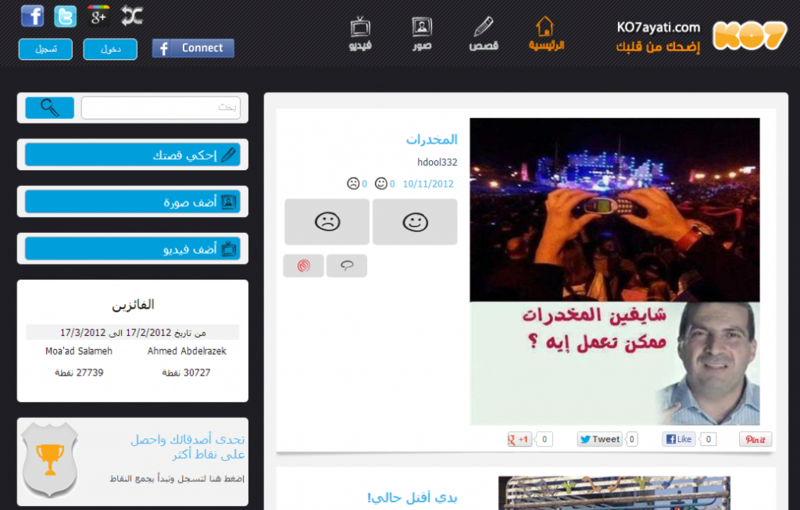 KO7 which is an abbreviation for K.O.7ayati, is an Arabic social site that we developed in 2011 for people to share fun things, images, videos and jokes. We initially set out to do a cross over between FML and 4Chan, however we ended up with something very similar to 9gag. At the time 9gag was still not as big as it is now, but at the time we’ve launched the site we we’re just another copy cat site. But none the less the site is still going and has proved to be a massive learning experience, especially on facebook where we managed to get over 18K likes within 3 weeks. Oh and I can’t really explain what K.O.7ayati stands for, because it is rather derogatory. But it is a very common bad word in the Middle East and is very similar to what FML stands for in English.